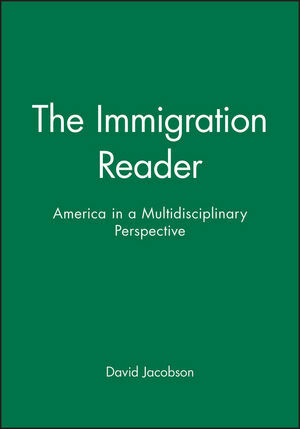 A superb collection of readings by the most important scholars in the social sciences working on immigration studies. Introduction: An American Journey: David Jacobson (Arizona State University). Part I: History of Immigration to the United States:. 1. Immigration as a Pattern in American Culture: William H. A. Williams (Union Institute, Cincinnati Centre). 2. What is an American? Ethnicity, Race, the Constitution and the Immigrant in Early American History: Roger Daniels (University of Cincinnati). 3. Immigration: History of US Policy: William S. Bernard (Brooklyn College). 4. The Changing Face of Post-1965 Immigration: Reed Ueda (Tufts University). Part II: Immigration and Contemporary Ethnicity:. 5. From South of the Border: Hispanic Minorities in the United States: Alejandro Portes (Princeton University). 6. Asian Immigrants: Social Forces Unleashed After 1965: Bill Ong Hing (Stanford University). 7. Voluntary Immigration and Continuing Encounters Between Blacks: Roy Simon Bryce-Laporte (Colgate University). 8. The Social Organization of Mexican Migration to the United States: Douglas Massey (University of Pennsylvania). Part III: The Economy and Immigration:. 9. The Impact of Immigrants on Employment Opportunities of Natives: George J. Borjas (Harvard University). 10. US Immigration and the New Welfare State: Thomas J. Espenshade (Princeton University). 11. Foreign Investment: A Neglected Variable: Saskia Sassen (Columbia University). 12. Immigrant Entrepeneurs in America: Koreans in Los Angeles: Ivan Light (UCLA). Part IV: Comparative Perspectives on Immigration:. 13. Multiculturalism and Immigration: A Comparison of the United States, Germany, and Great Britain: Christian Joppke (European University Institute, Florence). 14. Immigration and Group Relations in France and America: David L. Horowitz (Duke University). Part V: Political Debate on Immigration:. 15. Membership: Michael Walzer (Princeton University). 16. Aliens and Citizens: The Case for Open Borders: Joseph H. Carens (University of Toronto). 17. Immigrants and Family Values: Francis Fukuyama (George Mason, University). 18. Inclusion, Exclusion, and the American Civic Culture: Daniel J. Tichenor (Rutgers University). Epilogue. Where the Maps are Not Yet Finished: A Continuing American Journey: Jamie Godwin-White (Arizona State University). * Multidisciplinary social science perspective. * Covers history, contemporary issues, the economy, and comparative studies on immigration to the US. * Selections by the most important figures in this field.